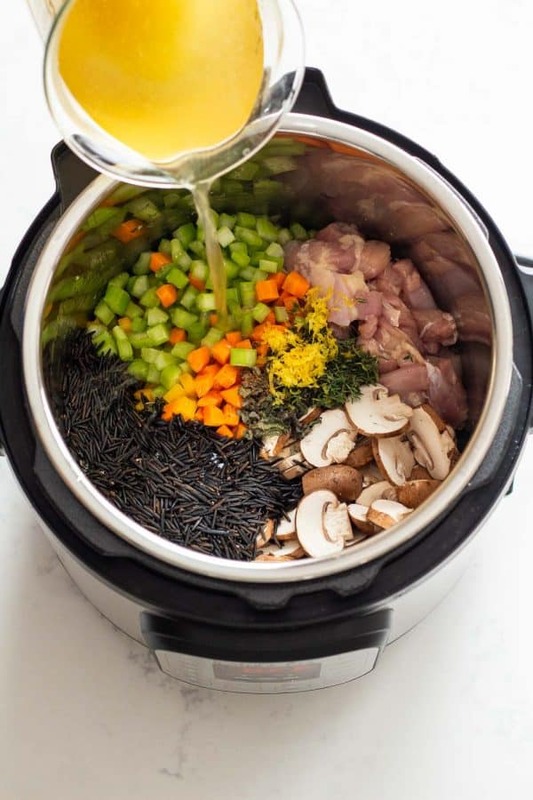 The creamiest and most delicious Instant Pot Chicken Wild Rice Soup! This soup is loaded with vegetables, protein, and healthy carbs. 10 minutes prep is all you need. After cooking Instant Pot wild rice for the first time I was shocked to say the least. Up until then, brown rice was my favorite in terms of taste and white Jasmin rice in terms of quick and easy to prepare. Now, I’m Mrs. Wild Rice! Wild rice is delicious, that was always clear, but oh man it takes FOREVER to cook. Right?!? Well yes, but only in a regular pot on the stove. Not so much in the pressure cooker. Woot woot! 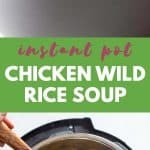 Mix that pressure cooked wild rice with chicken and a boatload of vegetables, add some broth and then make it creamy and you’ve got the most delicious Instant Pot Chicken Wild Rice Soup of all times! This is one of those soups that warm up your bones. One of those soups that warm your soul!! 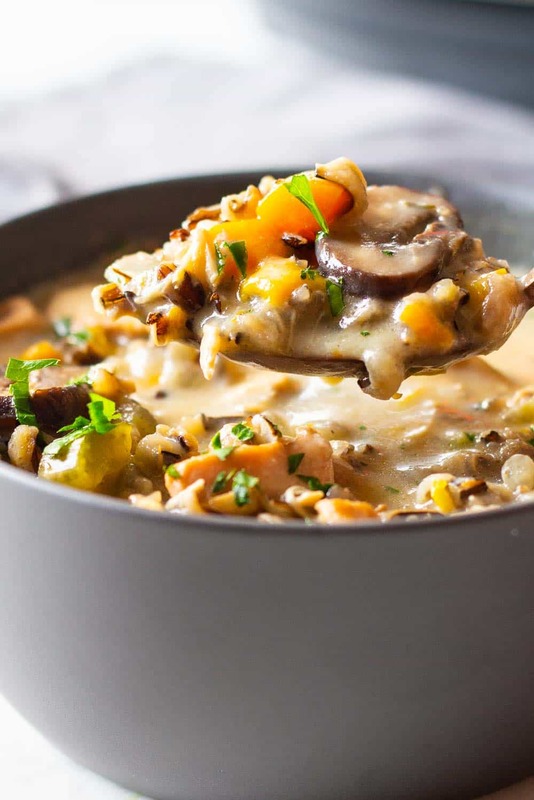 If you know anybody that currently needs a little more than a hug to feel good again, make this Instant Pot Chicken Wild Rice Soup for them, they’ll be grateful forever. Promise! 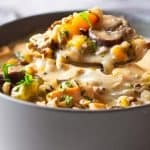 Is Chicken Wild Rice Soup Healthy? Absolutely! You’ve got a well-balanced soup recipe here loaded with vegetables, protein and healthy complex carbs. Yes, it contains a béchamel sauce to make it creamy that some people might argue isn’t the healthiest. It’s made from scratch though folks, and remember we need healthy fats in our diet. Also, the béchamel can easily be made gluten-free if you need it. Best gluten-free flours to make béchamel: rice flour, buckwheat flour, or millet flour. And, it can also be easily be made dairy-free: replace the butter with olive oil and the milk with dairy-free milk such as soy or almond. How Long Does It Take To Cook Wild Rice in the Instant Pot? A mere 30 minutes + natural pressure release. So, no, it’s not done in the blink of an eye. However, remember you don’t have to babysit it!! 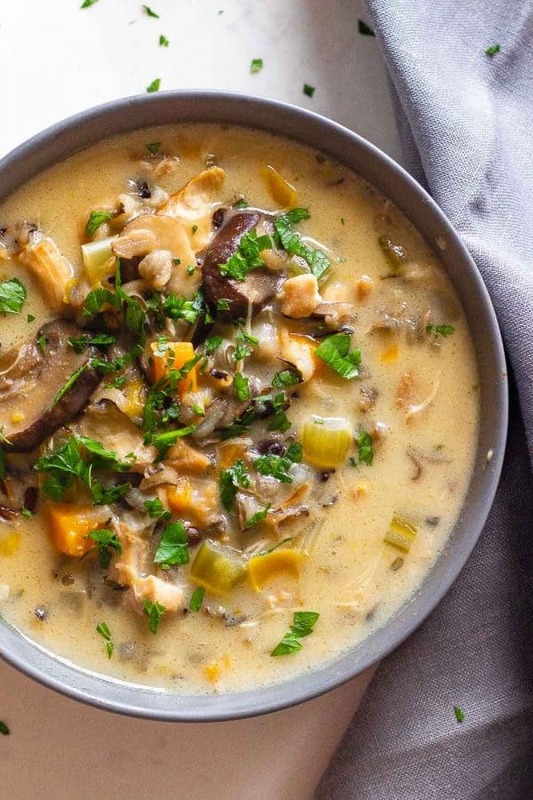 You don’t even have to be in the kitchen while the Instant Pot Chicken and Wild Rice Soup cooks itself. Because it does just that, it cooks itself. And, you don’t have to cook the wild rice separately as in some soup recipes I’ve seen out there. You cook all together in ONE pot and you’re done with it. You can in theory even skip the browning the onions and garlic part and just dump all ingredients into the pressure cooker, close it and program it and walk away. That would make it a 15 minute prep time meal (if you’re a real slow veggie washer and chopper). I honestly don’t recommend it though. Making a sofrita out of the chopped onions and garlic makes a huge difference in flavor. It’s worth the extra five minutes. Now let’s not talk any more about this Instant Pot Chicken Wild Rice Soup and rather get right into the recipe, shall we? 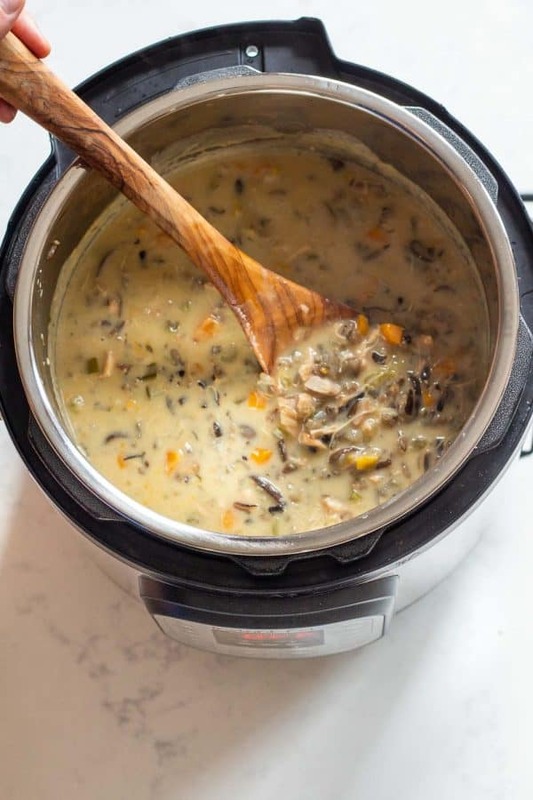 The creamiest and most delicious Instant Pot Chicken Wild Rice Soup! This soup is loaded with vegetables, protein and healthy carbs. 10 minutes prep is all you need. Peel and chop onion and garlic. Peel and cube carrots and wash and cube celery and bell pepper. Slice mushrooms. Cube chicken thighs. Press "sautée" and once the Instant Pot says "hot" add a dollop of oil, chopped onions and garlic and brown them. Once nice and brown add a splash of water to deglaze, then add cubed chicken, mushrooms, cubed vegetables, wild rice, 4 cups of chicken broth, sage, thyme, lemon zest and nutmeg and season with salt and pepper if your broth is not already seasoned. Securely close the lid and turn the valve to the sealing position. Hit "cancel" and then set the Instant Pot to high pressure for 30 minutes, then let the pressure release naturally (this can take anywhere from 20-25 minutes). When the high pressure cooking time is over and the Instant Pot's alarm goes off prepare a Béchamel sauce. Béchamel: Add 1/4 cup butter to a small saucepan and melt over medium-low heat. Once melted, add 1/4 cup flour and whisk until well combined. Add cream and whisk well (don't worry if it curdles), then add 1/2 cup milk and whisk until well combined and keep whisking until milk is heated up, then immediately remove from heat and continue whisking until it thickens (about 5 minutes without stopping). Add Béchamel to ready cooked soup in Instant Pot and stir. You can serve like this, or wait a little and keep stirring. The longer you stir, the thicker the broth will become. For super-duper, extra creamy broth, hit the soup button (keep the lid OFF) to bring everything to a boil and keep stirring for 10 minutes so the broth and béchamel become one creamy soup. Season with sea salt and pepper if necessary, sprinkle with freshly chopped parsley and enjoy. This recipe was inspired by Pinch of Yum’s Wild Rice Soup. I made it and it was amazing! Still learning to use the IP and I loved the results. I added all of the ingredients and it was fantastic! Thank you!!!!! Question, not comment! Can you double the recipe and still have it fit in the Instant Pot? It depends on the size of your IP. In an 8 quart you might be able to double it. In a 6 quart I doubt it. Made this tonight and happy with the results. Lovely blog post! A few comments for the readers: I am counting calories right now and this can totally work. I ate two big ladles worth and it’s coming up to about 280-290 calories depending on what calculators I’m using. At that rate, this is a whopping 11 servings! (Husband ate 4 big ladles worth.. so for most people probably 6 ish servings for full recipe). For the blogger: I love optionated bloggers! Like, use dark meat so the chicken isn’t dry. Why such specificty on rice type? Just cook time? I made this last night and it was really good! Left out the bell peppers because I’m not a fan. The only reason this is 4 stars and not 5 is because the recipe was written a bit confusingly in two places. The first place was the sauté part – it never says if you need to turn off the sauté option at any point, but I felt really uncomfortable with the idea of sautéing uncooked rice and that just didn’t seem right so I tossed everything in except the rice, browned the chicken, and then turned it off to add the rice. The other confusing direction is stirring in the instant pot while it’s set to soup – soup is a high pressure setting so I wasn’t sure how that worked. I ended up keeping the setting but putting it to low pressure which I think is what you meant to have us do? I mean, it worked! The soup itself was so good though. I added some worchestershire sauce at the end because it’s a magic ingredient for creamy soups and I had like three servings. I would be happy to receive that soup in a restaurant. Hi Nicole, I’m sorry the instructions were confusing to you. There is a video in the recipe card that shows all the instructions as well, just in case. I’m not sure why you thought the chicken and rice or anything has to be sautéed. I will try and change the instructions to make that clearer for others, so thanks for letting me know it wasn’t clear. You press sautée “add oil, chopped onions and garlic and brown them”. Once they are brown you add all other ingredients (chicken, rice, chicken broth, spices etc. ), not to sautée, it doesn’t matter if the sautée button is still on or not, this is a 30-second process. You add everything, you press cancel and set the Instant Pot to pressure cook. This was a really great recipe! I did use chicken breast instead of thighs with great results – not dry. I cut the chicken up into cubes and started the cooking process when it was still fairly frozen so perhaps that allowed it to stay tender and moist. This soup was SO delicious!! I followed it to a few, with the exception of omitting celery because I’m not a fan :) The flavors were amazing. Thank you so much!! Will definitely be making again. Yay!!! I’m so happy you liked it! :D I love this soup so much! The flavor was good, but the texture was pretty mushy. I wonder if a reduced pressure-cooking time would help. I’ll probably try that next time. Loved it, thank you for the recipe! I did 15 minutes with a quick release, then added the carrots and celery and 1/2 cup arborio rice, then 15 more minutes at high pressure with a 15 minute natural release. I also added Trader Joe’s mixed frozen wild/fancy frozen mushrooms. My husband and kids, who are not into mushrooms, liked it too. Great lunch for a winter day. I think it would probably serve 6 adults; it made a lot! As someone who is lactose intolerant, could I use soy, almond or coconut milk to make the bechmel? How would they change the flavor? Hi Pamela, yes! It works great with almond milk. If you react to butter, too you can use olive oil instead. I’ve tested that, too. It will taste different but still absolutely delicious! Can this recipe be made with black rice (forbidden rice)? If so, any idea on how to adjust the cooking time? Hi Nancy, I’ve cooked black pearl rice in the Instant Pot before (like not in soup, just regular) and it takes the exact same amount as wild rice so I would assume it’s totally possible and should work with the same timing. Can you leave the cream and maybe substitute with more chicken broth to make it less fattening? 30g of fat per serving is quite a lot but the soup sounds good. Hi Brooke, absolutely. It won’t be a creamy soup but still absolutely delicious. Leave out the entire Bechamel sauce. I eat up to 70g of fat a day in my 1,800-calorie day so it doesn’t concern me that the meal has 30g per serving but it obviously depends a lot on what you had for breakfast and lunch. It’s definitely on the higher side of fat content. Awesome! Thanks for the tip. I am making it tonight and will let you know how it turns out. I am trying to slim down after the holidays and every little bit helps! Excited to try this recipe! Well, tried to make. Didn’t realize I was to let pressure release naturally until I had already released pressure and rice was not done. Watched the video, which typically isn’t necessary and found it’s a natural pressure release. Recipe says 1/2 cup milk in one place and 1 cup in another. I’ve added a little cook time and then will allow pressure to release naturally. Hopefully the dish will be ok. Probably will not make again due to poorly written recipe. I’m really sad you feel this recipe deserves a 1* rating because I had a typo of missing “/2” in the instructions to make sure you add 1/2 a cup not 1 cup of milk to the béchamel. The instructions state very clearly that it needs natural pressure release. It even states how long this may take: “6) Cook on manual high pressure for 30 minutes, then let the pressure release naturally (this can take anywhere from 20-25 minutes).” I hope you were able to save your soup and enjoy it. Will this recipe fit in my 3 quart pot? puh, not sure, it would be quite full. You can always half the recipe actually. Half all ingredients, leave instructions and timing the same. Can you use chicken thigh with the bone? Yes! Absolutely! Even more delicious :) No need to adjust the cooking time. This was the first meal I attempted in my Christmas InstaPot and it was wonderful. My husband has named it “that really good soup”. I followed the recipe to the tee, used organic, thin sliced chicken breast and it was very tender. I added red pepper, because we in Texas love spicy foods. And I added parmesan on top of the soup. Excellent recipe and I will make this again and again (hope to freeze some too). Making your pot roast tomorrow, will keep you posted. I’m so so happy you liked it Gail!!! Hi Pam, I never claimed it was fast. More than that, I mention in the blog post that it is not a fast recipe. The more volume in the pot, the longer it takes to come to pressure. It’s normal that it takes long. In terms of the rice absorbing ALL the liquid, no that’s not normal. You say you added 1/2 cup more rice. Did you add a total of 6 cups broth then? Because that’s what you should have added with that amount of wild rice. Did you also add the bechamel sauce? That’s what makes the soup creamy and soupy in the end. I’m glad that the pressure release time is accounted for in the estimate, but the pressure-up time needs to be added as well. I love the lemon in this and the Soup is so creamy and delicious! I don’t have an Instant Pot and never really wanted one until I saw this recipe. I do have a slow cooker and of course stove top. How would you recommend I make this without an Instant Pot? Hi Adelle, I haven’t tested this but I’ve frozen similar soups to this and it worked perfectly fine. I would absolutely do it. Incredible recipe! Remind me of my years living in Minnesota! Chicken and wild rice soup is really big there. Love all the incredients. I’ve purchased a really good chicken broth with high protein, all natural, so this soup is packed with nutrients! Definitely enjoyed making it! Thank you so much for sharing! I so happy you liked it Bree :D Thank you for coming back and commenting and rating the recipe. I really appreciate it! Made this for dinner tonight. It was SO delicious! Even my pickiest of eaters tried it, with scrunched nose, and then loved it enough to eat the whole bowl. It is so yummy! Thank you! Plus, I love that it was so easy in the instant pot. Love my instant pot! OMG, you have no idea how happy your comment makes me!!! Children are by far the hardest to please so I take your son’s empty bowl as the biggest compliment ever!!!! I love my instant pot, too!!! Any way to make this dairy and gluten free. Maybe add more broth. yes, I answer that in the blog post :) Here is the paragraph: “Also, the béchamel can easily be made gluten-free if you need it. Best gluten-free flours to make béchamel: rice flour, buckwheat flour, or millet flour.